Josie Grim started her career at the Glen Rock Mill Inn at the insistence of her sister-in-law, the former General Manager, Alyssa Steyer, in 2016. Alyssa believed that filling in as a part-time bartender on the weekends would help Josie, a naturally shy person, break out of her bubble, meet new people and learn new skills. Josie, like many of our Mill family, has a deep connection to Glen Rock and the Southern York County community. Not only was Josie related to the former owners and operators, but she's also been a Southern York County resident for most of her life, living just outside of Glen Rock before moving to Shrewsbury (and beyond) in 2000. In the summer of 2016, Josie made the decision to once again return to Glen Rock. Prior to starting at the Mill, Josie worked at Southern York County's Oakworks for almost 20 years, before transitioning from her manufacturing background to managing her own independent contracting cleaning business. 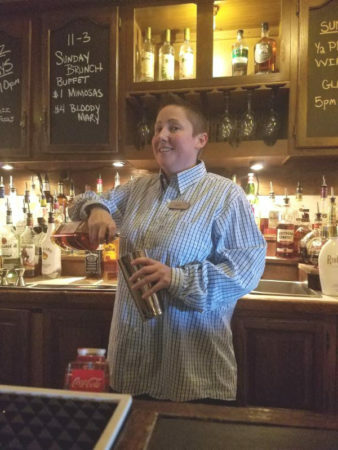 With the support of the new management team and Mill staff, Josie turned her part-time bartending gig into a bar management career that she now loves. With a natural aptitude for flavors and a strong memory, her bar knowledge quickly grew from basic drinks to a deeper understanding of craft beers, wines and higher end liquors. Josie's new found knowledge, along with the support of the Mill team, gave her the tools to rise to her Bar Manager position in April 2018, and continues to allow her to provide patrons with an elevated farm-to-bar cocktail experience. Josie is thrilled to be a part of the Mill family and her wonderful ability to place faces with drinks has made her a favorite with restaurant patrons. She also believes that thanks to Brandon's leadership skills and the changes he’s implemented over the last year, the dynamics of the bar and restaurant have led to a more adventurous clientele. Josie enjoys seeing people who would normally just pop in for a drink now actively participating in all the Mill has to offer. Josie believes that bartending is so much more than making drinks, it’s about making connections with others while providing them with an excellent experience. Turns out, Alyssa was right when she pushed Josie to try something new by working the bar–the experience has been great and she loves it! Come visit Josie and ask her to mix you one of our signature Glen Rock Mill Inn cocktails, and see why she has such a loyal following!